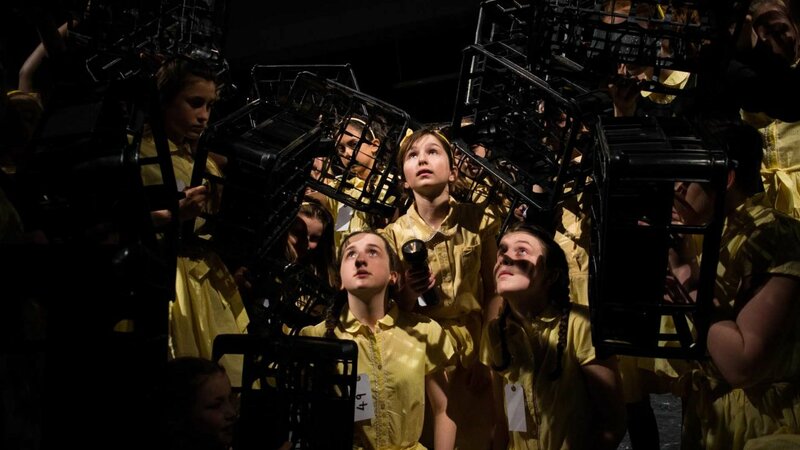 A cast of Year 7, 8 and 9 girls staged a highly creative physical performance based on Roald Dahl’s ‘Matilda’. Across two evenings ‘Tales of Matilda’ explored the key moments and themes of the famous children’s story; resilience, self-belief and inspiration. Matilda, a young girl neglected by her parents, finds a kindred spirit in her teacher Miss Honey and helps her to stand up to Mrs Trunchbull. The performance was staged in a World War 2 era environment with the school children characters representing evacuees. The creative process was based on the practices of theatre practitioner Bertolt Brecht and the values of ‘Ensemble Theatre’, a collaborative approach in which everyone can share ideas and take ownership of the story-telling process. The girls rose to the challenge of performing in this way, as well as being surrounded on four sides by the audience in an engaging and moving production.